Are you heading to the beach this summer and looking for the perfect manicure? 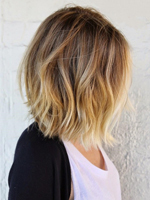 Maybe you are just hanging by the pool and want a beachy look to go along with your summer plans. Maybe you are staying home and just want the beach to come to you. 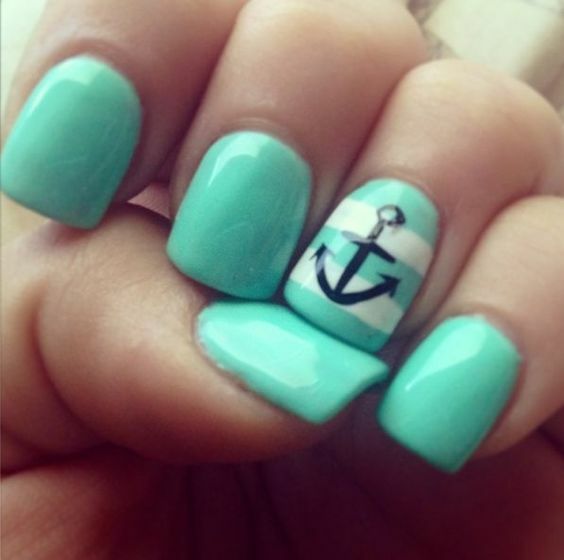 Aqua manicures make for a great summer style to meet all your beach loving needs. Grab your towel and get ready to feel the sand between your toes. 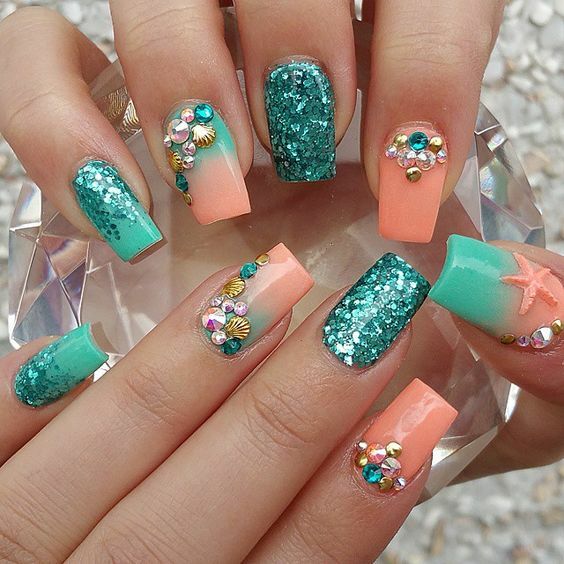 You do not even have to touch the ocean to get the vibe from these beach inspired manicures. 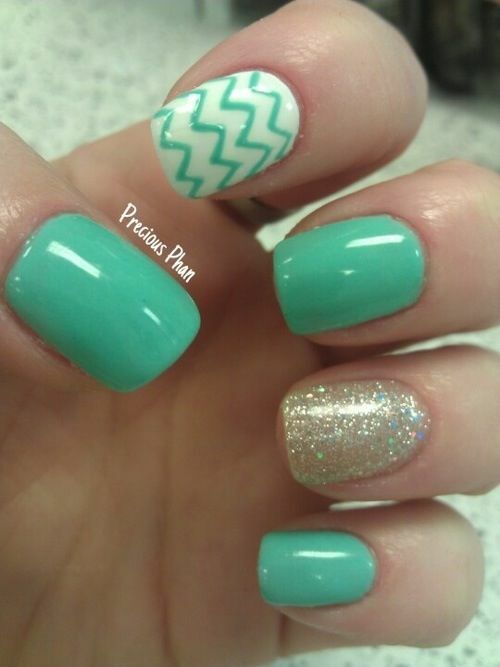 Aqua manicures are a hot summer trend. The color is not only beautiful but fun as well. When the summer sun hits, try adding this blue hue to keep a cool look in even the hottest of weather. You can purchase the color from a local store and do your own nails, or head into the nail salon to make all your summer daydreams come true. You will be ready for everything on your busy vacation to do list. 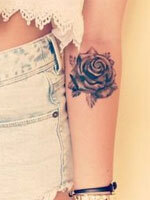 The best part is, you will look good while doing it. 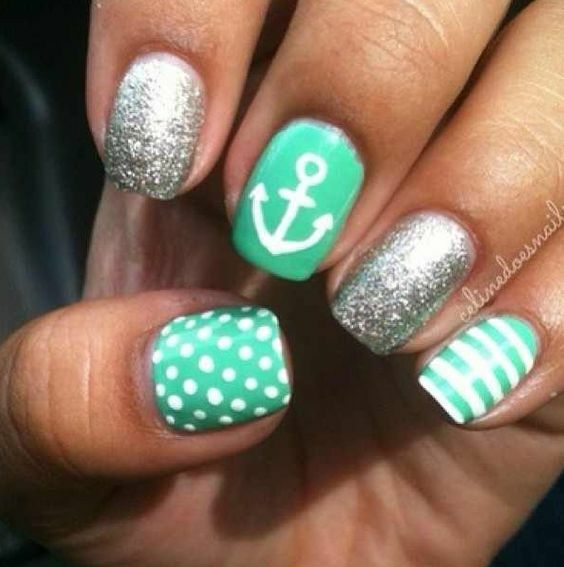 If you are ready to say “ahoy, matey,” this list is a great place to start looking for summer nail art inspiration. This simple design would make for a great summer manicure. 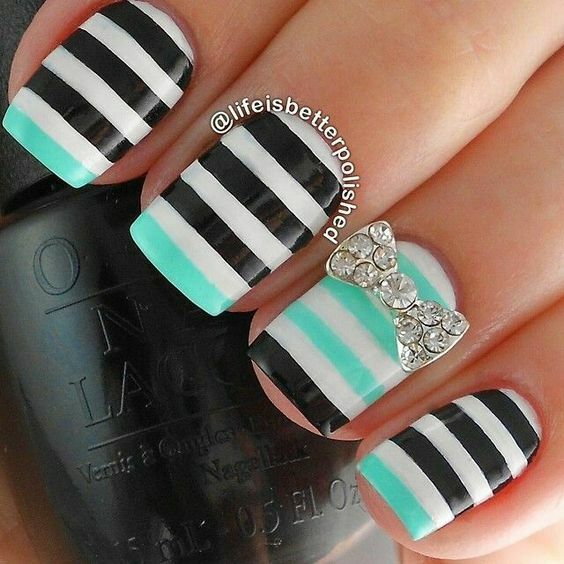 With aqua polish and a few nautical stripes across the nail of the ring finger, this design could be done at home. A few embilishments can go a long way. This beachy look proves that. If you want to do your nails at home, stop by your local beauty store to find different gems for your nails. Add them on top of your polish for a simple yet gorgeous manicure. If you want to add a dash of glitter to your summer look, this manicure might suit you. This look keeps it simple with just enough design to impress. If using fake nails, you can paint the design on before gluing the nail on to make things easier. An ombre manicure is not hard to achieve at home. If you have a sponge around your house, you can definitely copy this look. Paint your colors onto the sponge first. Dap the sponge onto your nail until you achieve the desired effect. 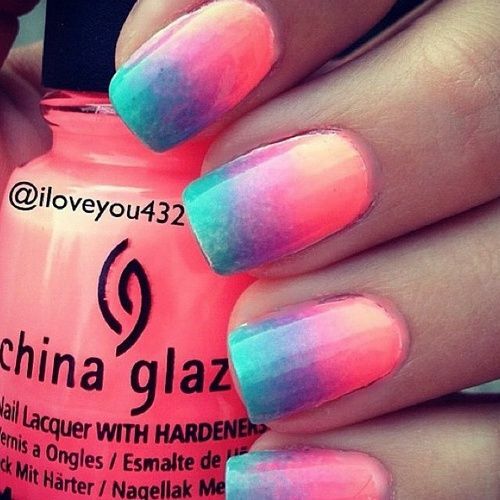 Voila, you have the perfect sunset inspired manicure. 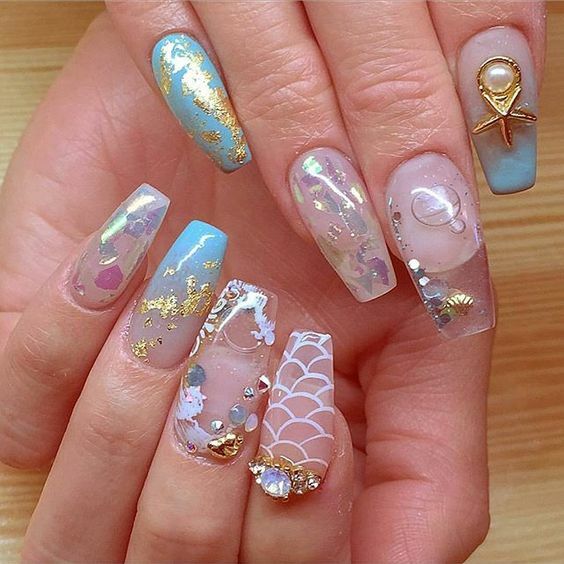 With all the designs in this manicure, the glitter helps separate them to bring the whole look together. If you prefer just one design, any of these would be great to wear on your nails this summer. Nautical stripes can be dolled up with a pretty bow. This manicure can be done at home with a little pacience and a few colors. Start with a white base coat. Once that dries you can add your stripes. Tape off the area you are going to paint to avoid errors. 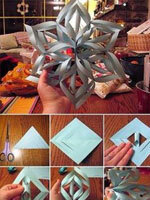 Add a top coat and your bow to finish the design. Floral designs have forever been a manicure staple. This pretty daisy is a modern spin on the classic favorite. Paired with some glitter, these cool nails would be fun to do yourself. Simple isn’t for everyone. For those who love lots of flair, adding gems to your nails is the answer. This glitter look pairs aqua and a sandy peach color together to make for the ultimate summer manicure. 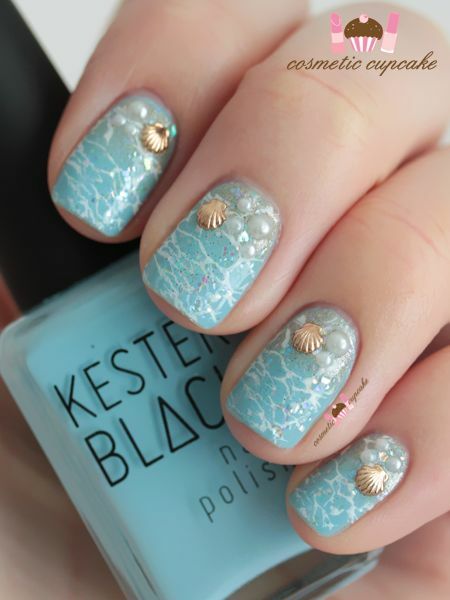 For aqua nails that make you want to draw in the sand, this look is perfect. Though simple, the design brings the beach to you. You don’t even need a beach bag to enjoy this summer manicure. Aquarium nails are a trend with mixed reviews. Love them or hate them, this look is definitely an amazing one for summer. These water nails bring the beach to you if you can’t catch the time to sneak away for vacation. Once you have the perfect manicure on your nails, why not get a matching pedicure? This palm tree design is definitely beach appropriate. It would also pair perfectly with most of the manicures on this list. 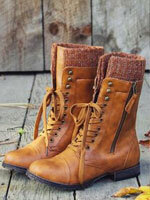 Another pedicure style to match your manicure, is this effortless style. With just a little glitter, this pedicure will keep your toes cute as you bury them in the sand. 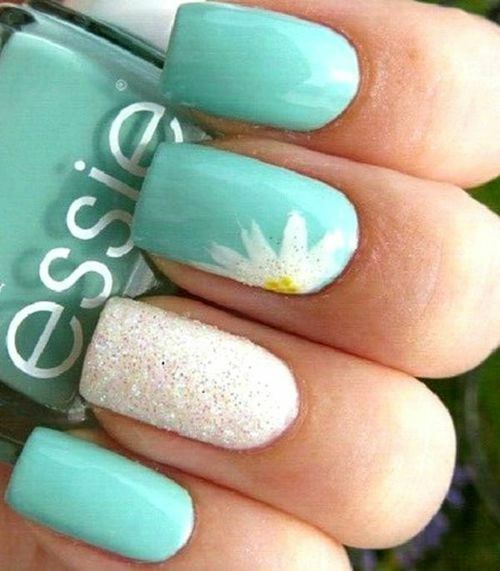 Since this look is very simple, you will be able to match it to any manicure you want.